MODEL NS18 - Most Popular! An 'Up and Down' period authentic reproduction of a vintage gas light fixture. 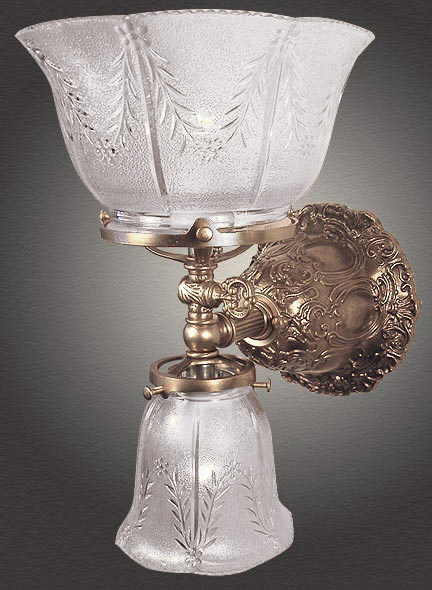 The stunning detail and historic accuracy of this fixture has made it one of our most popular models. Complete with realistic gas key, this model offers plenty of light and outstanding design! Also pictured with a lovely 4 inch and matching 2 inch 'Wheat Glass'. Solid cast brass construction. See MODEL NS143 for an alternate design and different glass shade. Can be mounted with glass facing up, down or even sideways during installation. Free mounting hardware included. Width 7 In. / Projection 9 In. / Depth 12 In.